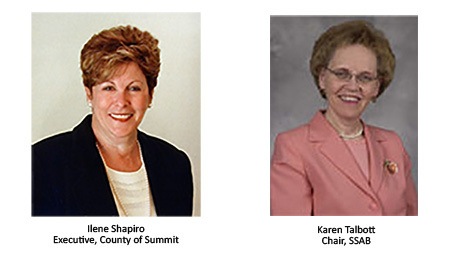 The Summit County Social Services Advisory Board (SSAB) was created in 1991 and given clarified, additional responsibilities through County Council legislation in 2001. The SSAB consists of 15-25 members who are appointed by the County Executive and approved by County Council. The full Board meets quarterly at the Akron Community Foundation and meetings are open to the public. Karen L. Talbott, President, Visiting Nurse Service & Affiliates (retired) chairs the Social Services Advisory Board. In addition to the SSAB Executive Committee, there are two primary committees: the Budget and Levy Review Committee and the Health and Human Services Committee. SSAB currently has 25 members, including Regular Members And Levy Agency Members. Members volunteer countless hours and are dedicated to the overriding goals and purpose of the Social Services Advisory Board.